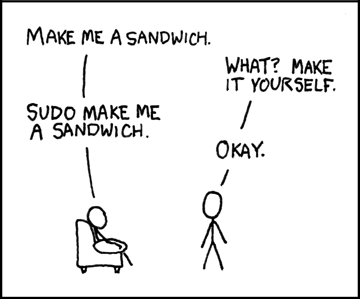 Users and Groups – /etc/passwd, /etc/group, su, sudo, chsh, useradd, gpasswd, etc. usermod – modify userid info, e.g. userid, comment, UID, GID, HOME, etc. The GECOS/comments/name field gets its GECOS name because it was used on the original Unix systems to store GECOS mainframe account information for printing. When a system has shadow passwords enabled (the default), the password field in /etc/passwd is replaced by an x and the user’s real encrypted password is stored in the second field of /etc/shadow. Each line in /etc/shadow contains the user’s login userid, their encrypted password, and several fields relating to password expiry. Used to create a new login account. Also creates a group with the same name. Usually the defaults are correct, but options let you change any of the information to be stored in the passwd and group files. Sometimes called adduser, but sometimes adduser is a different program with different options (e.g. Ubuntu). Remove an account from the password and group files. By default, does not remove the HOME directory or any files under it. To actually remove the home directory, you must use the -r option! if you forget -r, you will leave a home directory with no owner! drwx------   2 redshirt redshirt 4096 Nov 20 02:38 .
drwxr-xr-x. 13 root     root     4096 Nov 20 02:38 ..
drwx------   2  508  509 4096 Nov 20 02:38 .
drwxr-xr-x. 13 root root 4096 Nov 20 02:38 ..
drwx------   2 goldshirt goldshirt 4096 Nov 20 02:38 .
drwxr-xr-x. 14 root      root      4096 Nov 20 02:47 ..
Change any of the information about a user account. This command changes the stored information about the account, usually kept in the password and group files. The command modifies each account attribute separately. For example: Changing the name of an account only changes its name. It doesn’t change the groups for that user, nor does it change the home directory. Modifying user account information does not always automatically move or modify all the files owned by the account in the file system. If you change some account information, you may still have to walk the entire file system to find files owned by the old account and change them to match the new values you have set. Using both the -d and -m options, the usermod command is able to both change and move a home directory and all the files under it. You have to exit all shells for a user (e.g. exit from all su or sudo) before you can change that user’s accounting information. The last argument on the usermod command line must always be the login name of the existing account you want modified. Never put a new account name or directory last. RTFM! RTFM: Changing the HOME directory with -d changes only the field in /etc/passwd; it does not actually move the old HOME directory to the new location unless you also give -m.
If you have already used -d without using -m, you can’t do the command a second time with -m – it will say “nothing changed”, since you have already changed the name of the HOME in the password file. To do the command properly, you first have to put things back the way they were by using -d (without -m) to undo the change you made, then use -d with -m to redo the change. Every file system object has “group” permissions; if you are not the owner of the object but are in that group, group permissions apply to you. File system objects have only one owner and can be in only one group. Logged in users can be “in” (members of) multiple groups. BUT: At login, every user is given an initial group GID from the passwd file. A user will belong to other groups (supplementary groups), if the user is a member of those groups in the /etc/group file. When a system has shadow passwords enabled (the default), the password field in /etc/group is replaced by an x and the user’s real encrypted password is stored in /etc/gshadow. Starts a subshell as the new user, with that user’s privileges. Exiting the subshell goes back to the previous shell and previous user. Remember to exit the subshell; don’t keep nesting more and more subshells! If you don’t give a userid, it assumes you want to become the root user. Ordinary (non-root) users need to enter the password for the new account. A dash - or --login option (options must be surrounded by spaces) means use a full login shell that clears the environment, sets groups and goes to the specified user’s home directory as if the user had just logged in. Without the full login, the command will set privileges but will leave most of the existing environment unchanged, including an unchanged PATH and unchanged current directory (that may not grant the new user any permissions!). Without the --login function, you get a new shell with new permissions but much of your existing shell environment and your current directory are unchanged. You may not have a $PATH that includes system administration commands. $ whoami ; pwd ; echo "$PATH"
# whoami ; pwd ; echo "$PATH"
Execute a single command with other (usually root) privileges. Safer way to do root tasks (avoids running a whole shell as root). The password you type for sudo is your account password, not the root password. The root account can use the visudo command to update file /etc/sudoers with the list of who is allowed to use sudo and which commands they are allowed to run. For most actions that involve root privilege, use the sudo command to make the privilege change just for that one command. Do not start a root subshell (e.g. using su) until you have more experience. Mistakes made in a root subshell can destroy your system! If you do start a full subshell using the su or sudo -s commands, remember to exit your subshell to return to your previous account. Don’t keep layering multiple subshells inside each another. These commands deal with both the user/owner and the groups/group. The match between your logged-in user/groups and the file system owner/group determines the permissions you have on a file system object. The id command tells you everything about your logged-in account. On SELinux systems, you are also shown information about your security context. The command that changes the owner and/or group of a file system object (e.g. of a file, directory, etc.) is chown. Only the root user can change the owner of an object. The owner of an object can change the group of an object to any one of his/her list of groups.